Capture amazing views of Sitka, its stunning harbor and fishing fleet as you learn about Japonski Island’s fascinating World War II history. Local guides take you behind the scenes and give you the inside scoop on how real Alaskans live. Wireless microphones make hearing easy! 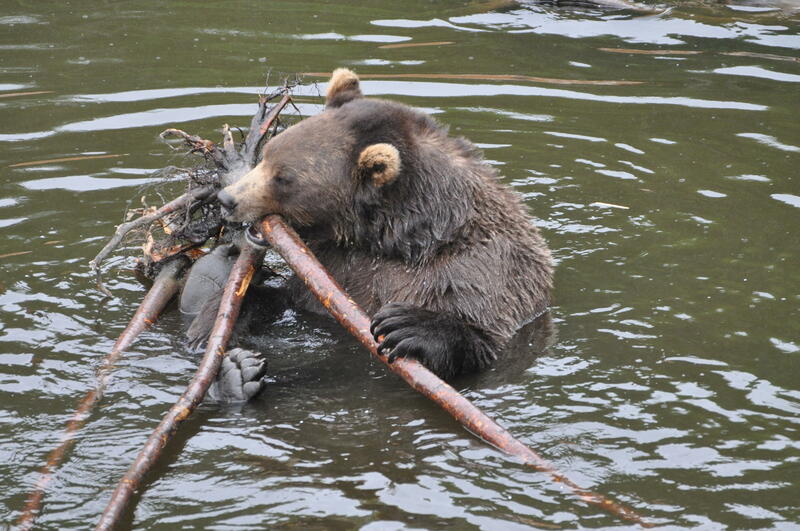 Meet the rescued Alaskan Coastal Brown Bears up close. Learn their stories and how we save orphan bear cubs from certain death. Take a short walk to snap photos of the stunning totem poles and the beautiful Indian River. Learn about the lifecycle of Alaskan salmon who have been spawning in the Indian River for millions of years. Make note of the ones you want to go back to see up close! You only have a few hours for a shore excursion in Sitka, Alaska, and you may never come back. What’s the best way to explore the area? Our two-hour, private Sitka shore excursion. Discover why Smithsonian Magazine called Sitka, Alaska, one of the Top 20 Small Towns to Visit in 2013. Capture amazing views of Sitka, its stunning harbor and fishing fleet as you learn about Japonski Island’s fascinating World War II history. Walk among the towering totems at the Sitka National Historical Park, visit our resident bear cubs who have been rescued from certain death at the Fortress of the Bears, and discover the amazing and true stories of Alaska’s most historic city. Let our local guides show you our Sitka, a Sitka as unforgettable as the images you take home with you. Make lasting memories as our knowledgeable local guides share with you a Sitka filled with amazing wildlife, incredible beauty, and unbelievable images. They tell you the engaging story of the totems, the history of the Fortress of the Bears, and share with you stories of our incredible Sitka-by-the-Sea. Be sure to bring your camera and plenty of batteries and storage to capture those once-in-a-lifetime shots! Escape the large, crowded bus tours some cruise ships offer and let our local tour guides show you the best of Sitka in our 10-passenger Nissan NV vans. We wear wireless microphones so everyone can hear our stories. Thousands of cruise ship visitors come to Sitka each day in the summer. Seats are truly limited on these small group tours. Please reserve your seat by purchasing your tour ahead online. See Sitka’s top three attractions in one amazing tour! Have a whale of a time on this marine wildlife excursion!